Time changes fast, so does the psychology of the generations. Every day, the education world tries different approaches bringing new methods and programmes to the schools to match the challenges of education of the youth. Each day we hear altered trends emerging in teaching and schooling, varying from eLearning to game-based learning, open classrooms to schools with no assessment, flipped classrooms to blended learning, and etc. The worldwide educational institutions like IB or Cambridge International Examinations (CIE) introduce new ideas and plans every year. Experts write books on how to improve the quality of the schools; administrators analyze their schools’ exam performance, then they revise their plans; and parents look for better schools and tuitions for their children. In short, the pursuit of better education continues. If we imagine a football team where there are good facilities, a qualified coach and any kind of helpful staff from driver to the masseur is available, one can easily see that without a group of well playing footballers, the team may not be successful in professional leagues. The coach should train them as well as mentoring them, and the club should provide a professional system to boost their performance. We can think of the school in a similar way. Teachers play the role of footballers. The school that I work has many distinguished programmes going on. It is an IB World and a Cambridge International school. It prepares students to higher international education through Diploma Programme, IGCSE and Cambridge Checkpoint exams. There are English as a second language programmes to provide better language learning besides second language education in Chinese, Japanese and French. Moreover, Writing and Research Paper programmes aim to improve students’ abilities in academic writing. There are certain plans and ongoing processes of participating in international and local competitions and Olympiads in which a lot of successful results have been achieved. It is possible to give many more examples if we were to think about each subject. In my observations and personal experiences working with many teachers so far, the programmes and curricula increase the level of the education to some certain extent. They also provide guidelines, set standards for us, and actually keep us focused on the process to achieve the goals determined by the board of directors. On the other hand, whatever we try to do to improve the school quality, there is one single factor outstanding among the others: teachers. I am not underestimating their advantages, yet prestigious programmes are not meaningful without teachers. There are standards, plans and schedules, but all will be effective in the hands of teachers. If they are successful in applying the given educational plans, then the programmes will be successful. If the school has good teachers who are open-minded and who can easily adapt into the new systems, then the school can transform its educational structure and can keep on applying the programmes. Some teachers are the flag holders, and they lead their students and the mentioned programmes to success. Not only do they improve their students, but also set good examples to others and play a crucial role in establishing a positive atmosphere at the school. On the other hand, some teachers can become obstacles for schools in various ways. I believe that “bad” teachers are the ones who are unqualified in academics and therefore failing in educating students. Additionally they are usually poor in classroom management, assessments and feedbacks, educational planning and other fundamental elements of being a teacher. The good teachers directly influence the students, parents and consequently their perception of the school. If a student has a bad teacher, which makes him hate the subject, then it is unlikely that that student will like the school. Similarly, the school will not be good in parents’ eyes. Everyone wants his or her children to be successful. Who wants a bad teacher? Moreover, bad teachers are the teachers who slow down the school’s progress. Besides being bad themselves, such teachers might affect the others morally, and school can become a negative working environment for the other teachers. The educational institutions develop policies and handbooks for all processes and situations. Planning everything well at the beginning, where everybody knows how to handle the next problem or the upcoming agenda is quite important. Otherwise there will not be any order, and teachers and administrators will be rushing to do the simple tasks. The procedures like programmes, cannot work by themselves. The school staff will make them work. It is regardless to say that teachers are the most important members of the school staff. Good teachers will complete their tasks on time; they will know how to solve problems. They will smoothly communicate with students and parents. Similarly, the bad teachers will have trouble finishing the duties properly and on time; they may even cause some extra problems. In addition to this, we can easily say that school facilities and resources are helpful only if the there are qualified teachers to use them efficiently. Even if there is lack of some resources, a good teacher may find ways to teach in a successful way, of course if supported by the superiors. Leadership is very important in this regard. Collaboration between the administration staff and teachers must be well arranged. A strong leader will support and motivate teachers to do their jobs well. Yet, at the end of the day, teachers go into the classes to do the teaching. School leadership is crucial for student achievement and school improvement; nevertheless, teachers are more important. In conclusion, I agree with Todd Whitaker. 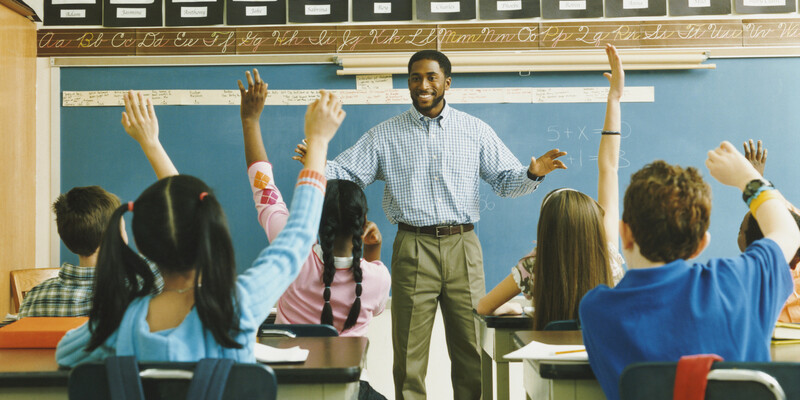 Teacher’s quality is the most important of the elements that determines the success of a school. Therefore the schools should hire better teachers or seek ways to improve their teachers’ quality. Professional development programmes and training sessions are very important for schools. Whitaker, Todd. What Great Teachers Do Differently. Taylor & Francis. 2011. This post is inspired by Todd Whitaker’s book. You can buy it from here.